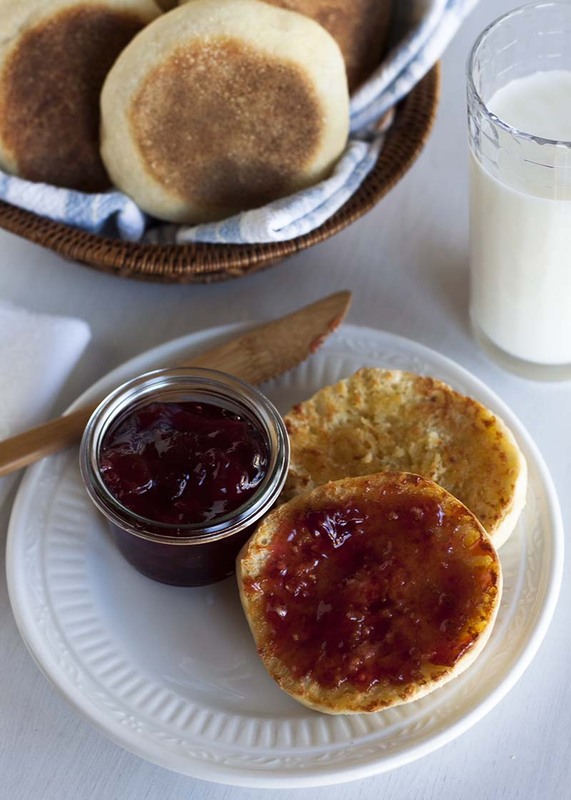 Homemade English muffins softer and more delicious than anything that comes out of a package. In a large mixing bowl, combine 2 cups flour, yeast, buttermilk powder, sugar and salt. Add water and butter to flour-yeast mixture. Beat 1 minute at low speed. Scrape down dough from sides of bowl. Gradually add more flour to form a soft, sticky dough. Cover the bowl with plastic wrap and let it rest overnight on the counter. Sprinkle surface with flour. Gently remove dough from bowl and roll dough to ¼-inch thickness with a floured rolling pin. Cut into 8 to 10 4-inch circles (*see note). Place on a greased cookie sheet. Cover and let rise until indentation remains after touching, about one hour. Preheated electric griddle to 300°F. Spray griddle with non-stick cooking spray and sprinkle with cornmeal. Carefully place muffins on griddle and bake 10 minutes on each side or until sides are deep golden brown. Cool on wire rack. To serve, split and toast. Top with butter or your favorite jam. *Cut out eight circles then gather the dough up and roll it out again and cut out two more muffins.